If you work in an all-round translation company as a project manager (PM), chances are that one day you may have to deal with assigning a project involving Chinese language. If you have never learned Chinese, this task may seem daunting as Chinese is not one language but a group of language variants. For detailed knowledge, please refer to Wikipedia “Chinese Language”. 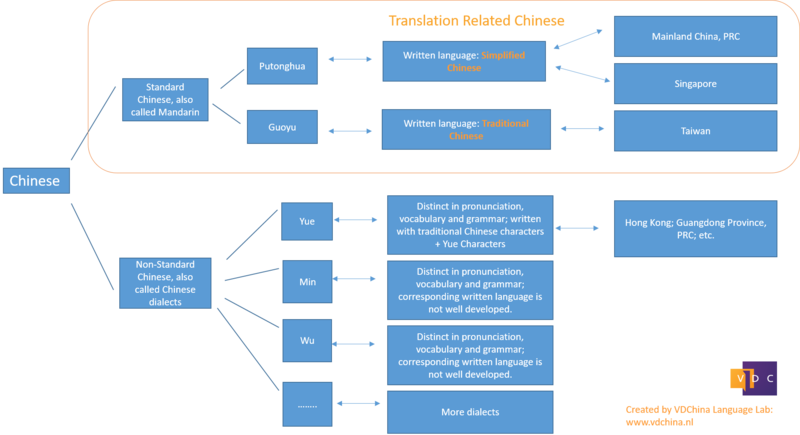 The Chinese language we encounter in the translation industry are in 99% of the time referring to Standard Chinese, also known as Modern Standard Mandarin, or simply Mandarin, besides which there are also quite a few non-standard Chinese variants (also called dialects). The variants of Chinese and corresponding user locations are illustrated in the diagram below. Of the Standard Chinese (Mandarin), there are two variants: Putonghua (the official language in Mainland China and Singapore) and Guoyu (the official language in Taiwan) which are written with simplified Chinese characters and traditional Chinese characters respectively. In terms pronunciation, vocabulary and grammar, the similarities and differences between Putonghua and Guoyu are somewhat comparable to those with American English and British English. The difference in simplified and traditional Chinese characters can be considered as spelling differences between the American and British English. Some characters are the same in both Chinese variants, and some are not. How to correctly know whether your text at hand is written in simplified or traditional Chinese if you have never learned any Chinese? For example, is the text “我是一名英中译者” in simplified Chinese or traditional Chinese? Copy and paste “我是一名英中译者” in Google Translate. Click the “Detect language” tab. Google will detect it as Chinese. In the box of target languages of Google Translate, select “Chinese (Simplified)” and then select “Chinese (Traditional)” as your target languages. You will have the tabs for both “Chinese (Simplified)” and “Chinese (Traditional)” side by side. Click “Chinese (simplified)” and see what happens. In this example, the target text is the same as the source, i.e. nothing is changed, which proves that the text is in simplified Chinese. Click the “Chinese (traditional)” and see what happens. In this example, the character “译” is changed to “譯”, indicating that the target text now is in traditional Chinese and the source is simplified Chinese. In a word, if nothing changes after you clicked a Chinese variant, then your source text is written in this Chinese variant. Of course, another more reliable way to know about the Chinese variant is asking one of your Chinese translators. How to apply the “native speaker principle” in Chinese translation? We all know that for the best quality possible, the translator should be a native speaker of the target language. So, for projects that need to be translated into Chinese, you need a native Chinese speaker. However, as mentioned above, the Chinese language is not one unified language but has two major variants. To answer the question stated in the title, you have to first find out who are the target readers of the translated content. If the readers are people in PRC, then you need a translator from mainland China who speaks Putonghua and writes in simplified Chinese; if the readers are people in Taiwan, you need a translator from Taiwan who speaks Guoyu and writes in traditional Chinese. Sometimes, you may have clients who want their content be translated into Chinese but do not know which Chinese variant they want. Most people in mainland China can read traditional Chinese although they prefer simplified Chinese. And the same is true with people in Taiwan or Hong Kong in regards to Simplified Chinese. If the end client do not know the geographic region of their Chinese readers, and only want the content be translated into one Chinese variant, then I would recommend the simplified Chinese as this variant has more users. In the current Chinese translation market, it is not that difficult to find native Chinese translators in all sorts of specializations, and therefore the “native speaker principle” is applicable when translating into Chinese. However, for translations from Chinese, this principle may become very difficult to apply. The reason is rather straightforward: there are significantly fewer native speakers (e.g. English, Dutch, German, French) translating from Chinese and among them even fewer are specialized experts in different fields. A good thing is that a significant portion of Chinese native speakers offers Chinese to English translation (with of course a huge diversity in translation quality). Therefore, a compromised version of the “native speaker principle” in Chinese to English translation would become a suitable Chinese translator translating into English plus an English native speaker doing the post-translation editing. If you are a project manager and have any comments or questions regarding Chinese language, please feel free to leave a message in the comment box or send me an email.